The King X750 Irons will be the breakthrough irons of the year. Most irons today are designed to maximize one specific performance benefit: either distance, forgiveness or feel, while sacrificing all other critical areas needed to hit more greens. The technology of the King X750 irons delivers the distance and forgiveness of a wide-sole iron while retaining the playability and turf interaction advantages of a thin-sole iron. 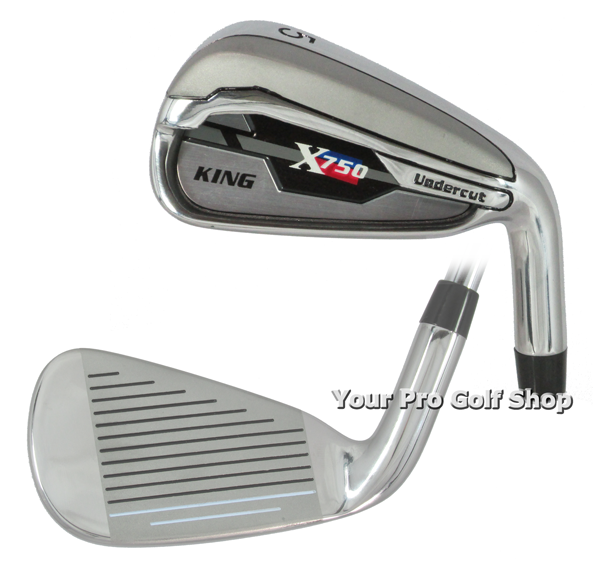 The King X750 irons will benefit all golfers from low handicappers to the higher handicapped golfers looking for the one of the most forgiving and highest performing golf irons on the market today. IX750-3 RH #3 18° 59.75 d 244 6.0 mm 39 in 0.370"
IX750-4 RH #4 20.5° 60.5 d 251 5.5 mm 38.5 in 0.370"
IX750-5 RH #5 23° 61.25 d 258 5.0 mm 38 in 0.370"
IX750-6 RH #6 26° 62 d 265 4.5 mm 37.5 in 0.370"
IX750-7 RH #7 30° 62.5 d 272 4.0 mm 37 in 0.370"
IX750-8 RH #8 34.5° 63 d 279 3.5 mm 36.5 in 0.370"
IX750-9 RH #9 39° 63.5 d 286 3.0 mm 36 in 0.370"
IX750-P RH PW 44° 64 d 293 2.5 mm 35.5 in 0.370"
IX750-A RH AW 49° 64 d 301 2.5 mm 35.5 in 0.370"
IX750-S RH SW 54° 64 d 305 2.5 mm 35.5 in 0.370"
IX750-L RH LW 59° 64 d 305 2.0 mm 35.5 in 0.370"